CERTAIN things were just made to go together: cheese and toast; sausages and beans; beer and the pub. And while recent UK-wide figures reveal a slight dip in beer sales (see p18), in 2018 – from independent craft beers to mainstream brands – a solid beer range remains a cornerstone of the Scottish on-trade, according to brewers, who told SLTN that the category is in rude health. “Enjoying a beer with friends remains one of life’s simple pleasures – and the resilience of the Scottish on-trade demonstrates this,” said Andrew Lawrence, sales and operations director for Scotland at Molson Coors. Admitting that in the beer industry “the only constant is change”, Lawrence said licensees must be light on their feet to keep apace with the latest trends and demands. “Consumer drinking habits, tastes and trends are always evolving,” he explained. “Whilst mainstream lager represents the biggest segment of the market, consumers are increasingly seeking out premium beers and ciders, as well as low and no-alcohol variants. Premium beer was also highlighted by Jerry Shedden, category and trade marketing director at Heineken UK, who said the brewer’s Greenpaper, which identified six ‘growth drivers’ for the trade, revealed that encouraging customers to trade up is “one of the easiest ways to increase customer spend”. “With such competition for space in the fridge, outlets should carefully consider the amount of space devoted to each category in order to maximise sales,” he added. Crawford Sinclair, director of sales at Innis & Gunn, has also witnessed strong performance from premium beer in Scotland over the past year. “Premiumisation will continue to be a major trend for operators in all categories, not just beer,” said Sinclair. Craft beer is an important consideration, said Sinclair, as it’s a category which is “going from strength to strength every month” in the on-trade. Admitting that it can be a “daunting” category to approach for the first time, Sinclair advised that as IPA, pale ales and lagers make up more than 70% of craft sales, they “are always the safest places to start building your craft option”. Echoing this view, Andrew Chapman of Keith Brewery said: “The majority of craft volume in Scotland is concentrated in only two styles: lager and IPA. He added that while over 50,000 premises UK-wide now stock craft beer, Scotland “is very quickly being seen as the ‘homeland’ of craft beer”. 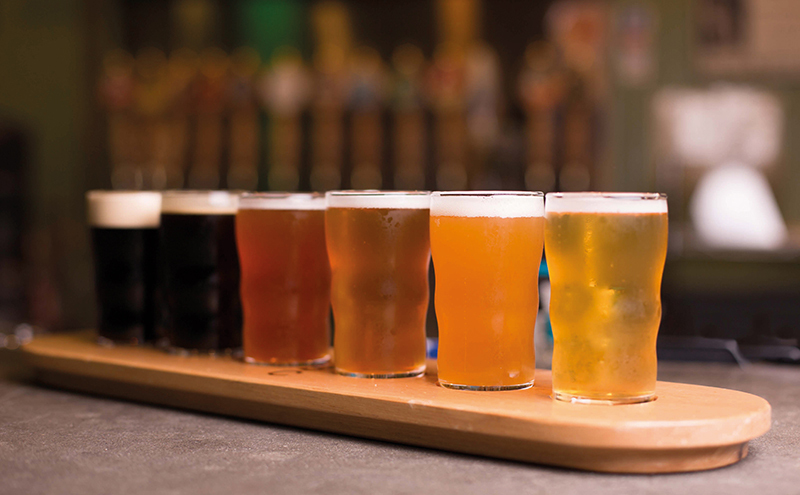 Jerry Shedden of Heineken UK said that as craft currently has a growth rate of 20% in both volume and value, it “presents a huge opportunity for licensees to tap into”. Similarly, Katy Heppel of Moray-based WooHa Brewing Company, said they are “hearing all the time about the thirst for something local”. “Licensees should be aware of what breweries are in their area and think about approaching them even before they’ve come to you,” she said. Ultimately, however, operators should always stock “well-recognised” brands as this “allows customers to be more experimental, knowing that they have the reliability of their well-known classics as a backup,” said Joanna Stickler of McEwan’s.